President-elect Donald Trump has confirmed the chief executive of Exxon Mobil, Rex Tillerson, as his choice for US secretary of state. In a statement, Mr Trump praised Mr Tillerson, 64, as among the "most accomplished business leaders and international dealmakers" in the world. Mr Tillerson is said to have a good relationship with Russian President Vladimir Putin, alarming both Democrats and some Republicans. Days ago it emerged that US intelligence agencies believe Russia acted covertly to boost Donald Trump in the election race. Can fossil fuels make America great again? How would a thawing US-Russia relationship work? The secretary of state is in effect the most senior US diplomat, responsible for enacting the government's foreign policy. Rex Tillerson fits the profile of Donald Trump's emerging cabinet, which includes many rich businesspeople. But the choice of an oil executive for secretary of state is the clearest sign yet that Mr Trump plans to approach foreign policy like a business, sending out his top diplomat to get the best deals for America. Whether that means Mr Tillerson will be prepared to open bedrock agreements to negotiation, as Mr Trump appears ready to do, is another question. He has been backed by stalwarts of the Republican foreign policy establishment who would see that kind of bargaining as dangerous to America's standing and alliances. Neither is it clear what Rex Tillerson's close ties to Moscow might mean for Mr Trump's Russia policy. His contacts within the power structure, developed over two decades as Exxon's main man in Russia, could prove valuable in the State Department. But many lawmakers are already wary about the president-elect's calls for closer ties with the Kremlin, which they view as a global security threat. 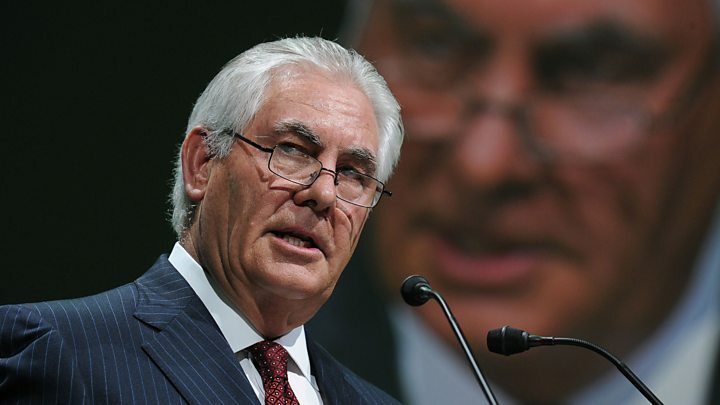 And Exxon's business interests there could lead to conflicts of interest for the new secretary of state, especially when it comes to his role in maintaining the Western sanctions regime imposed after Moscow's annexation of Crimea. Mr Trump has also selected former Texas Governor Rick Perry as his Energy Secretary, US media reported. Mr Perry famously forgot the name of the energy department during a cringe-inducing gaffe at a 2011 Republican primary debate, when he said it was among the agencies he would eliminate if he was elected president. The 66-year-old has also been a vocal critic of Mr Trump, calling him a "barking carnival act" and a "cancer on conservatism" before he dropped out of his second bid for the White House in 2015. "Rex Tillerson's career is the embodiment of the American dream," Mr Trump said. "His tenacity, broad experience and deep understanding of geopolitics make him an excellent choice for secretary of state." Media captionShell Oil ex-president John Hofmeister calls Trump's selection for secretary of state a "tough cookie"
Mr Tillerson said he was "honoured" by the nomination, adding that he shared Mr Trump's "vision for restoring the credibility of the United States' foreign relations and advancing our country's national security". 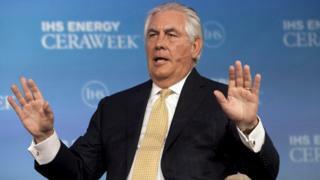 The announcement had been widely expected, with Mr Tillerson favoured over high-profile Republicans, including the party's 2012 presidential nominee, Mitt Romney. Although he has no formal foreign policy experience, as Exxon chief Mr Tillerson oversees a company with 75,000 employees and business activities in more than 50 countries. He has warned of the "catastrophic" impact of unchecked climate change, although his company has been accused of deliberately misleading the public about the role of fossil fuels in global warming. But it is his connections to Russia that have drawn most flak. He has forged multi-billion-dollar deals with Russia's state oil company, Rosneft, spoken out against international sanctions imposed on Moscow and in 2013 was awarded an Order of Friendship by the Kremlin. As rumours of his nomination gathered pace in recent days, one of Mr Trump's rivals for the Republican nomination, Marco Rubio, said being "'a friend of Vladimir is not an attribute I am hoping for from" the next secretary of state. Another Republican Senator John McCain expressed concern over Mr Tillerson's links to Mr Putin but promised he would get a "fair hearing" in the Senate. Reacting to the nomination, Mr Putin's foreign policy adviser, Yury Ushakov, said all Russian officials and not just the president enjoyed "good, businesslike relations" with Mr Tillerson. A Chinese foreign ministry spokesman said his country was "looking forward" to working with the nominee.